Surveillance photo of the two suspects. 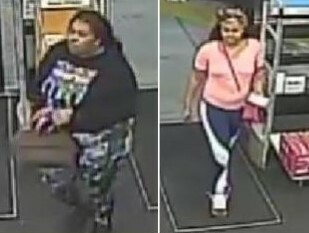 VISTA–San Diego County Crime Stoppers and Sheriff’s Department investigators are asking for the public’s help to identify and locate two unknown female suspects wanted in connection with a burglary that occurred at a gym in Vista. On January 7, between 5 and 6 p.m., an unknown suspect cut the lock off of a locker at Planet Fitness, located at 1980 University Drive. The suspect took credit cards, cash and a checkbook from the locker. A stolen credit card was used to purchase $1,000 worth of Visa gift cards at Walgreens located at 310 Sycamore Avenue. The first suspect is described as a black female adult with a heavy build. She has long hair and weighs approximately 220 pounds. She was last seen wearing a black, long sleeved shirt and camouflage leggings. The second suspect is described as a black woman with a medium build. She has long hair and weighs about 140 pounds. She was last seen wearing a pink top with blue and white leggings.